Lincoln features an ensemble cast of Daniel Day-Lewis as President Abraham Lincoln, Sally Field as First Lady Mary Todd Lincoln, Gloria Reuben as Elizabeth Keckley, Joseph Gordon-Levitt as Robert Todd Lincoln, David Strathairn as Secretary of State William H. Seward, Bruce McGill as Secretary of War Edwin Stanton, Tommy Lee Jones as Radical Republican Congressional leader Thaddeus Stevens, Hal Holbrook as Francis Preston Blair, Michael Stuhlbarg as Kentucky Democratic Congressman George Yeaman, James Spader as Republican Party operative William N. Bilbo, Tim Blake Nelson as lobbyist Richard Schell, Jackie Earle Haley as Confederate States Vice President Alexander H. Stephens and Jared Harris as Lieutenant General Ulysses S. Grant. Day-Lewis' performance was phenomenal, the hallmark of the man, performed so powerfully by Day-Lewis is calm, self-confidence, patience and a willingness to play politics in a realistic way. Lincoln's concern about his wife's emotional instability and the strains of a wartime presidency... produce a portrait that is intimate but also decorous, drawn with extraordinary sensitivity and insight and focused, above all, on Lincoln's character as a politician. Doris Kearns Goodwin described Lincoln in his final months as a leader with "the rare wisdom of a temperament that consistently displayed an uncommon magnanimity to those who opposed him". Producer Kathleen Kennedy described Day-Lewis's performance as "remarkable" after 75% of the filming had been completed, and said, "Every day you get the chills thinking that Lincoln is sitting there right in front of you." 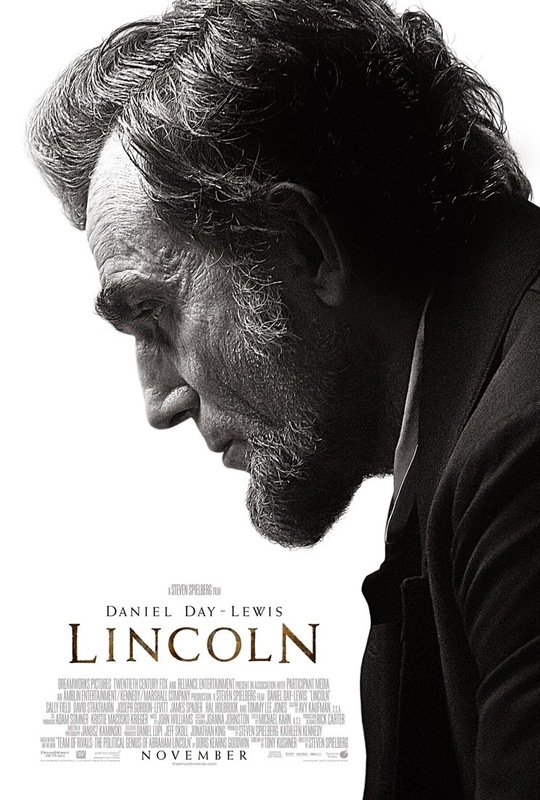 Lincoln is one of Spielberg’s best film since Schindler’s List and Saving Private Ryan. It’s brilliantly acted, written, directed and shot. The film will take its place in cultural history and remain there for all time. Due to it’s narrative boldness, visual audacity, and emotional directness. One of the best films of the year! Also, see my review for War Horse. 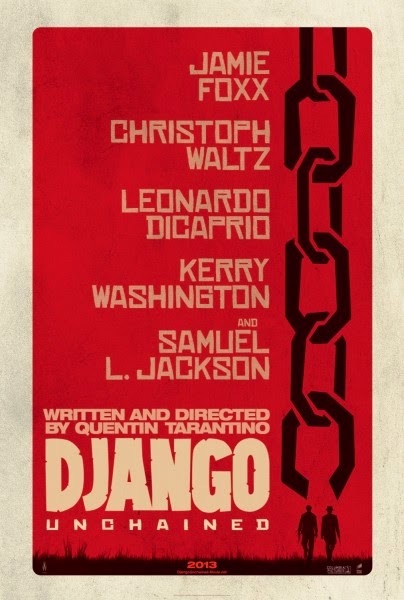 Film Review: "Django Unchained" (2012). "'How do you like the bounty hunting business?' 'Kill white people and get paid for it? What's not to like?'" Which is what this outrageous film called Django Unchained is all about! This American epic western film written and directed by Quentin Tarantino. Set in the antebellum era of the Deep South and Old West, the film follows a freed slave, Django, who is trained and treks across the United States with a bounty hunter, Dr. King Schultz, on a mission to rescue his wife from a cruel and charismatic plantation owner, Calvin Candie. The title Django Unchained alludes to the titles of the aforementioned 1966 Corbucci film Django, as well to Hercules Unchained – the American title for the 1959 Italian epic fantasy film Ercole e la regina di Lidia, which deals with the a mythical hero’s escape from enslavement to a wicked master – and to Angel Unchained – the 1970 American biker film that deals with a biker exacting revenge on a large group ofrednecks. Django Unchained is the third feature film in cinema history to use the title convention of a proper noun followed by the expression, "unchained". In 2007, Quentin Tarantino, speaking with The Daily Telegraph, discussed an idea for a form of spaghetti western set in America's pre-Civil War Deep South which he called "a southern", stating that he wanted "to do movies that deal with America's horrible past with slavery and stuff but do them like spaghetti westerns, not like big issue movies. I want to do them like they're genre films, but they deal with everything that America has never dealt with because it's ashamed of it, and other countries don't really deal with because they don't feel they have the right to." Tarantino later explained the genesis of the idea: "I was writing a book about Sergio Corbucci when I came up with a way to tell the story. One of the things that's fun when you write about subtextual criticism ... you don't have to be right. It doesn't have to be what the director was thinking. It's what you're gathering from it. You're making a case. I was writing about how his movies have this evil Wild West, a horrible Wild West. It was surreal, it dealt a lot with fascism. So I'm writing this whole piece on this, and I'm thinking: 'I don't really know if Sergio was thinking [this] while he was doing this. But I know I'm thinking it now. And I can do it!" Tarantino finished the script on April 26, 2011, and handed in the final draft to The Weinstein Company. In October 2012, frequent Tarantino collaborator RZA said that he and Tarantino had intended to crossover Django Unchained with RZA's Tarantino-presented martial-arts film The Man with the Iron Fists. The crossover would have seen a younger version of RZA's blacksmith character appear as a slave in an auction. However, scheduling conflicts prevented RZA's participation. One inspiration for the film is Sergio Corbucci's 1966 spaghetti western Django, whose star Franco Nero has a cameo in Django Unchained. Another inspiration is the 1975 film Mandingo, about a slave trained to fight other slaves. Tarantino included scenes in the snow as an homage to The Great Silence. "Silenzio takes place in the snow. I liked the action in the snow so much, Django Unchained has a big snow section in the middle", Tarantino said in an interview with The Guardian. The film stars Jamie Foxx, Christoph Waltz, Leonardo DiCaprio, Kerry Washington, and Samuel L. Jackson. The performances in this film were all spectacularly and outrageously enjoyable. Jamie Foxx as the film's title character gave an incredible performance as the freed African slave turned bounty hunter hellbent to rescue his wife. He owned the screen all the way. Christoph Waltz gave an outrageously humorous performance as former dentist, bounty hunter with a devilish attitude. Definitely worth the Golden Globe award! Leonardo DiCaprio was an outstanding and ruthless villain as Calvin Candie. He hadn't blown me out my chair with a villainous performance since his 1998 film The Man with the Iron Mask. Especially when gives the monologue about old Ben. He’d never been more terrifying. Kerry Washington gave an incredible performance as the film's damsel-in-distress, Broomhilda. Which was amazing for a newcomer to the screen, to my knowledge. And lastly Samuel L. Jackson as Stephen, the film's other villain, was amazing even after four Tarantino collaborations, he is 'good!' It is as though their collaboration are a match made in film heaven. I cannot wait to see more future collaborations between these two. Leone explained for The Good, the Bad and the Ugly (1966) that "the killings in my films are exaggerated because I wanted to make a tongue-in-cheek satire on run-of-the-mill westerns... The west was made by violent, uncomplicated men, and it is this strength and simplicity that I try to recapture in my pictures." Which is exactly what Tarantino has done for this bold, bloody and stylistically daring masterpiece, Django Unchained. A classic Tarantino genre-blending thrill ride, the film is violent, unrestrained, and thoroughly entertaining. It is one of the greatest Western films ever made and it is Tarantino’s finest accomplishment as a filmmaker. As he has proven that Spaghetti Western can still exist in modern cinema, as well as proving that the genre can still be art. Tarantino has made his best movie since Pulp Fiction (1994), and it is one hell of a ride. It is a big, bold, audacious western movie that will annoy some, startle others and demonstrate once again that he's the real thing, a director of quixotic delights. The film contains marvellous sense of detail and spectacular set pieces. To conclude, I liked what I saw, and I wanted more! Film Review: "Gangster Squad" (2013). "Every man carries a badge. Some symbol of his allegiance. His were the scars of a boxer who'd used his fists to climb the social ladder of the mob. A Jew who'd gained the respect of wops through a homicidal lust. He'd sworn an oath of violence. And his master? His own insatiable will to power. He wanted to own this town. His name was Mickey Cohen." This is the premise of Gangster Squad. This crime film directed by Ruben Fleischer, from a screenplay written by Will Beall based on the novel Tales from the Gangster Squad by Paul Lieberman. 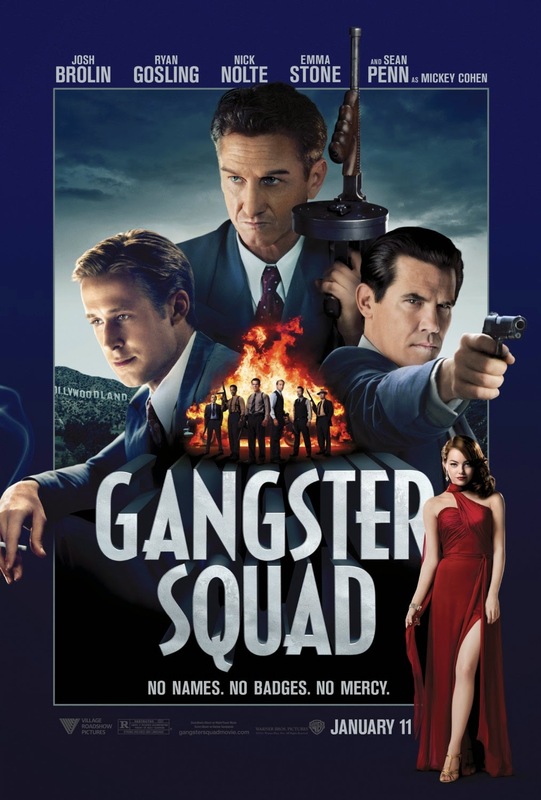 Based on the story of LAPD officers and detectives forming a secret group called the "Gangster Squad unit", led by two determined sergeants work together, who attempt to keep Los Angeles safe from Mickey Cohen, who runs the city, and his gang during 1949. The first trailer for Gangster Squad was released on May 9, 2012. In the wake of the mass shooting at a theater in Aurora, Colorado on July 20, the trailer was pulled from most theaters running before films and airing on television, and removed from Apple's trailer site and YouTube due to a scene in which characters shoot submachine guns at moviegoers through the screen of Grauman's Chinese Theatre. It was later reported that the theater scene from the film would be either removed, or placed in a different setting since it is a crucial part of the film, and the film would undergo additional re-shoots of several scenes to accommodate these changes. This resulted in the release of Gangster Squad being delayed. About a week after the shootings in Aurora, Warner officially confirmed that the film would be released on January 11, 2013, bumped from the original September 7, 2012 release date. Two weeks later, on August 22, the cast reunited in Los Angeles to completely re-shoot the main action sequence of the film. The new scene was set in Chinatown where the Gangster Squad comes into open conflict with the gangsters as they strike back. The film stars an ensemble cast that includes Josh Brolin, Ryan Gosling, Nick Nolte, Emma Stone, and Sean Penn. The performances in this film well generally mixed. The cast gave terrific performances but ultimately the characters were terribly under-developed and forgettable. The two talented actors that disappointed me the most were Emma Stone and Sean Penn. Stone's performance was disappointing because of her under-developed "damsel-in-distress" character had seemed to lack confidence and nostalgia, and I thought that Stone and Gosling had a much better chemistry in Crazy, Stupid, Love (2011) but in this film it curdles into lukewarm mush. Penn's performance was just as laughable as his silly looking make up. Gangster Squad goes about its business without a trace of finesse. The film fails in the end. The best of the old noir crime dramas had lively pacing and crisp tough-guy dialogue. This movie seems at times like an exercise in slow motion and in dull, cumbersome writing. Film Review: "Les Misérables" (2013). The tagline of the film reads "Fight. Dream. Hope. Love." Which is the essence of this screen adaption of Les Misérables. This British musical drama film based on the musical of the same name by Alain Boublil and Claude-Michel Schönberg which is in turn based on Les Misérables, the 1862 French novel by Victor Hugo. The film is directed by Tom Hooper, adapted by William Nicholson, Boublil, Schönberg and Herbert Kretzmer. The film tells the story of Jean Valjean, an ex-convict who becomes mayor of a town in France. 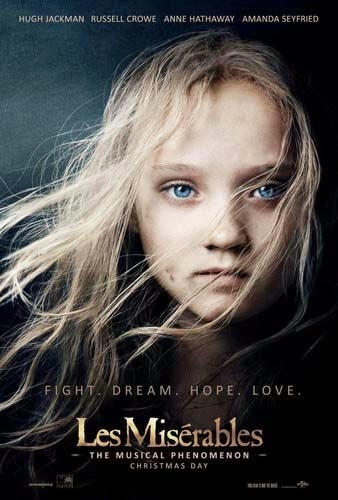 Soon exposed, Valjean agrees to take care of Cosette, the illegitimate daughter of a dying Fantine, but as a fugitive must also avoid being captured again by police inspector Javert. The plot spans 17 years and is set against a backdrop of political turmoil, which in the film culminates in the June Rebellion of France. My feelings for the performances in this film were somewhat mixed, there were satisfactory performances. The satisfactory performances being; Hugh Jackman as Jean Valjean, Anne Hathaway as Fantine, Amanda Seyfried as Cosette, Eddie Redmayne as Marius Pontmercy, Helena Bonham Carter as Madame Thénardier, Sacha Baron Cohen as Thénardier and Samantha Barks as Éponine. They were all general favorable performances were able to keep me from total boredom throughout the entire film. But the main two, Jackman and Hathaway, were the best because either they could sing magnificently or had, at least, one 'good' song in the entire film. Such as Jackman's performance, the charisma had been stripped to the bone, and it was a thrilling confirmation of the other kind of star Jackman is. He brought depth to Valjean's tale of offense and grace, of taking responsibility for a child and then letting go, and his rendition of Bring Him Home had emotional heft. Hathaway's performance of I Dream a Dream, she gave it everything she had, beginning in quiet sorrow before building to a woebegone climax: she gasps, she weeps, she coughs. If you are blown away by the scene—as many will be. The centerpiece of a movie composed entirely of centerpieces belongs to Anne Hathaway, who as the tragic heroine Fantine sang another of the memorable numbers. Her performance was angelic which made it superb as the tragic Fantine. The film is only worth seeing for Hathaway alone. And there were dissatisfying and disappointing performances. Unfortunately that was none other than Russell Crowe as Javert, who was the only rotten apple who was spoiling the whole barrel. His performance and his singing was just down-right boring, miserable and unenthusiastic. The only question I can ask is 'why on earth cast Russell Crowe in this film? His performance highlights, for me, one of the major flaws in this film. Les Misérables, the popular musical, is rather histrionic, boring, and lacking in both romance and danger. But one cannot criticize the sheer spectacle of the film. Teen romance and constant singing replaces the vital elements familiar to fans of the musical and the novel, and director Tom Hooper obscures any remnants of classy stage spectacle with the same overkill that Joel Schumacher brought to Phantom of the Opera (2004). Film Review: "Rise of the Guardians" (2013). "It is our job to protect the children of the world. For as long as they believe in us, we will guard them with our lives..." This sums up the premise of Rise of the Guardians. This 3D computer-animated fantasy-adventure film based on William Joyce's The Guardians of Childhood book series. Directed by Peter Ramsey and produced by DreamWorks Animation. 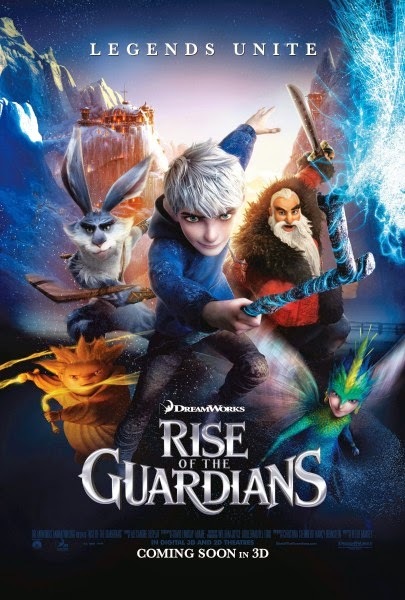 The film tells a story about the Guardians (North or Santa Claus, the Tooth Fairy, Bunnymund or the Easter Bunny, and the Sandman), who enlist Jack Frost to stop Pitch from launching an assault on the world in darkness and protect the innocence of children all around the world. Although the film is based on the Joyce's book series, it contains differences from the books. The book series, begun in 2011, explains the origins of the characters, while the film takes place about 200 years after the books, and shows how the characters function in present time. Joyce explained, "Because I don't want people to read the book and then go see the movie and go, 'Oh, I like the book better,' and I also didn't want them to know what happens in the movie. And I also knew that during the progress of film production, a lot of things can change. So I wanted to have a sort of distance, so we were able to invoke the books and use them to help us figure out the world of the movie, but I didn't want them to be openly competitive to each other." The idea for the Guardians came from Joyce's daughter, who asked him "if he thought Santa Claus had ever met the Easter Bunny." The film features the voices of Chris Pine as Jack Frost, Alec Baldwin as Santa Claus, Hugh Jackman as The Easter Bunny, Isla Fisher as The Tooth Fairy and Jude Law as Pitch. The performances in this film were all superb and deserve merits in their own ways. Pine's performance was superb in a kids film of this kind as he able to bring a care-free, devil-may-care attitude to the film. But as well as deep emotion and dark adult tone. Baldwin's performance was a surprising and impressive as he able to make himself unidentifiable and unrecognizable to me. He was able to master an accent perfectly for this role. Jackman's performance was enjoyable and humorous, and so in touch with his 'Aussie' side which made the character ever more memorable. Fisher's performance was a great one as she able to project beauty, kindness and warmth to the role. Lastly Law's performance was not only dark and moody (in a good way), but also menacing as the film's villain. Like a superior, state-of-the-art model built from the imagination, DreamWorks’ buoyant, witty and robustly entertaining fantasy smash-up, Rise of the Guardians, is pure escapism for children and adults, boasting rich animation while it reserves humor that offset the potentially lumbering and unavoidably formulaic aspects of this two-hour team-origin story. 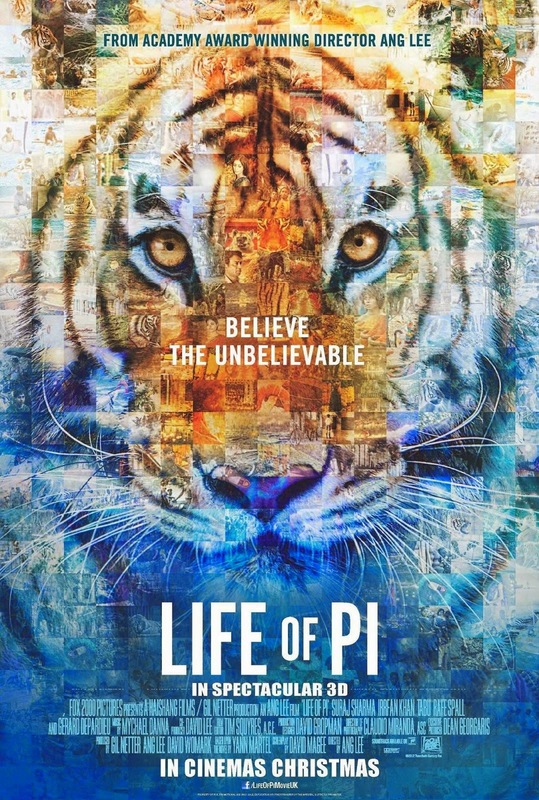 Film Review: "Life of Pi" (2012). "Mr. Patel's is an astounding story, courage and endurance unparalleled in the history of ship-wrecks. Very few castaways can claim to have survived so long, and none in the company of an adult Bengal tiger." This is the premise of this amazing movie, Life of Pi. This adventure drama film based on Yann Martel's 2001 novel of the same name. Directed by Ang Lee, the film is adapted by David Magee. The film is about a 16-year old boy named Piscine Molitor "Pi" Patel is the son of a zookeeper who lives with his family in Pondicherry, India. The family decides to move to Canada, due to political turmoil, by traveling on a huge freighter, with some animals from the zoo. There he suffers a shipwreck in which his family dies, and is adrift in the Pacific Ocean on a lifeboat with a zebra, a hyena, an orangutan and a Bengal tiger named Richard Parker. The project had numerous directors and writers attached, and the Los Angeles Times credited Fox 2000 Pictures executive Elizabeth Gabler with keeping the project active. Gabler in February 2003 had acquired the project to adapt Life of Pi into a film. She hired the screenwriter Dean Georgaris to write an adapted screenplay. In the following October, Fox 2000 announced a partnership with M. Night Shyamalan (The Sixth Sense (1999)) to direct the film. Shyamalan was attracted to the novel particularly because its protagonist also comes from Pondicherry in India. The partners anticipated for Shyamalan to direct the film adaptation after completing The Village (2004). Shyamalan also replaced Georgaris as the screenwriter, writing a new screenplay for the film. Ultimately, Shyamalan chose to film Lady in the Water (2006) instead, and Fox 2000 Pictures decided to find another director. In March 2005, they entered talks with Alfonso Cuarón (Harry Potter and the Prisoner of Azkaban (2003)) to become the director. Cuarón decided to direct Children of Men (2007) instead, and in October 2005, Fox 2000 Pictures hired Jean-Pierre Jeunet (Amiele (2001)) to direct the film. Jeunet began writing the adapted screenplay with Guillaume Laurant, and filming was scheduled to begin in mid-2006, partially in India. Jeunet eventually left the project, and in February 2009, Fox 2000 Pictures hired Ang Lee (Crouching Tiger, Hidden Dragon (2001)) to direct the film. In May 2010, Lee and the producer Gil Netter proposed a reported budget of $70 million, at which the studio balked, placing the project's development on hold for a short time. David Magee was hired to write the screenplay, as Lee began to spend several months looking for someone to cast as Pi. After 3,000 men auditioned for the film's lead, in October 2010 Lee chose to cast Suraj Sharma, a 17-year-old student and an acting newcomer. Upon receiving the role, Sharma underwent extensive training in ocean survival, as well as in yoga and meditation practices to prepare for the part. Two months after Sharma was cast, it was announced that Irrfan Khan would play the adult Pi. Principal photography for the film began on January 18, 2011 in Pondicherry, India until January 31 and moved to other parts of India, as well as Taiwan. The crew filmed in Taiwan for five and a half months in Taipei Zoo, an airport in Taichung, and Kenting National Park, located in Pingtung County where Lee was born. Over there, the ocean scenes of the film were shot at a giant wave tank built by the crew in an abandoned airport. The tank is known as the world’s largest self-generating wave tank, with a capacity of 1.7 million gallons. After photography was completed in Taiwan, production moved back to India and concluded in Montreal, Canada. The film stars Suraj Sharma, Irrfan Khan, Gérard Depardieu, Tabu, and Adil Hussain. The performances were all perfect. But I would to praise the two characters who portrayed Pi; Suraj Sharma as Piscine Molitor "Pi" Patel, age 16 and Irrfan Khan as adult Pi. Both of them together brought 'a tour de force' peformances as they were able to accomplish what any actor wants and longs to accomplish - realism of the human condition, with going over-the-top. And they have accomplish that goal beautifully and masterfully (totally Oscar-worthy performances). For the film's animalistic star, Richard Parker, the element of realism also made his performance in the film terrifying and yet mesmerizing. But not the kind of realism found in the real world, the kind you would find only in the computer. With the power of CGI. The lead visual effects company for Life of Pi is Rhythm & Hues Studios ((R&H) The Chronicles of Narnia Series (2005-10) which has its corporate headquarters in El Segundo, California. 3D effects for the film were created by a team of artists from all of the R&H divisions, including locations in Mumbai and Hyderabad (India), Kuala Lumpur (Malaysia), Vancouver (Canada), and Kaohsiung (Taiwan). Artist Abdul Rahman in the Malaysian branch underscored the global nature of the effects process, saying that "the special thing about Life Of Pi is that it was the first time we did something called remote rendering, where we engaged our cloud infrastructure in Taiwan called CAVE (Cloud Animation and Visual Effects)." The R&H Visual Effects Supervisor Bill Westenhofer said that discussions of the project began with Ang Lee in August 2009. hythm & Hues spent a year on research and development, "building upon its already vast knowledge of CG animation" to develop the tiger. Life of Pi can be seen as the film Rhythm & Hues has been building up to all these years, by taking things they learned from each production from Cats & Dogs (2001) to Yogi Bear (2009), integrating their animals in different situations and environments, pushing them to do more, and understanding how all of this can succeed both visually and dramatically. Ang Lee's Life of Pi is an beautiful, tense adventure survival drama that's masterfully directed and visually stunning. The film restores a sense of wonder, terror and possibility to the big screen that should inspire awe among audiences and critics alike.